A once largely-ceremonial presidency has this century become the center of gravity in Turkish politics, with last night's failed attempt by the military at seizing power now fully rendering President Recep Tayyip Erdogan the most powerful autrocrat in the Middle East. If there was any hope that Turkey would slide back from its march towards Islamic law and authoritarianism, that hope was lost this morning with Mr. Erdogan landing in Istanbul and beginning what promises to be one of the biggest purges in the country's history since Atatürk sought to craft a secular state. Already the accusations of "treason" are sounding loudly in Turkey, with calls for the head of anyone involved in the conspiracy against a man who is now the proven victim of an anti-democratic insurrection, one that promises to upend the lives of the people regardless of how events ultimately play out on the ground. In a country where thousands of individuals have been made the target of state security after voicing criticism of Mr. Erdogan, we can now expect prosecutors to take an even harsher line in bringing charges against dissidents. Without presenting any evidence, Mr. Erdogan has already accused the followers of Fethullah Gulen of orchestrating this latest conspiracy against his government, promising an even harsher crackdown on an already outlawed group. 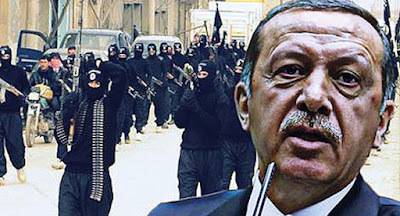 But it's not Mr. Gulen's followers that Mr. Erdogan is primarily concerned with; his primary concern lies in the nearly 3 million-strong army of Syrians which he will soon allow to become Turkish citizens. To complete his takeover of the secular state, Mr. Erdogan must build a base of religious loyalists who owe everything to his policies and his survival. Yesterday's coup wasn't against the government of Mr. Erdogan, it was a coup by Mr. Erdogan against Europe's secular future. The demographics of Turkey will change forever, and with the visa-free access into the European Union which will be enjoyed by these future Turkish citizens of Syrian descent, so will the demographics of all Europe be altered beyond recognition. It's not a surprise that the French Embassy in Istanbul issued a warning a couple of days ago: the French knew elements within the military were working to prevent Mr. Erdogan from granting citizenship to three million people who will adhere not to Turkey's secular values, but rather to his Muslim cult of personality.